1) Remove the yellow pistil from inside the flower and wash the flowers well. 2) In a mixing bowl, mix together gram flour, poppy seeds, red chilli powder, salt and water and make a batter of smooth consistency. 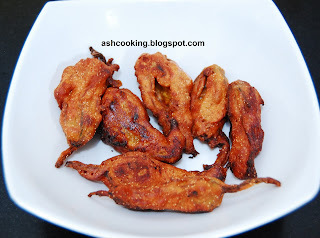 3) Coat the flowers with this batter and deep fry.